I went over to HWS and read the journal – a fine thing, typed and leather-bound and in a slip case. Beside my interest in the content (spoiler alert: that will be November’s blog), my immediate questions were: Who was Alice? Was she related to William Henry Seward? What was her Geneva connection? 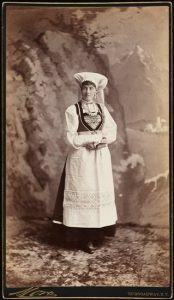 At the time she wrote the journal, Alice Seward (1852-1927) lived in New York City but summered in Geneva with her younger sister Caroline Seward Endicott (1859-1929). 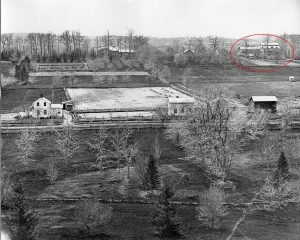 Their house on Hamilton Street, circled in red, is now McCormick House on the HWS campus. It was prominently situated in this 1870s photo but is now walled in by modern dormitories. The Sewards were part of New York City society. Alice and Caroline were invited to William and Alva Vanderbilt’s costume ball in 1883. It marked the completion of the Vanderbilts’ new mansion on Fifth Avenue and redefined the “who’s who” of social circles in the city. 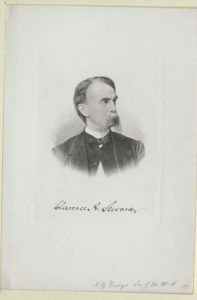 Alice’s father, Clarence Armstrong Seward (1828 – 1897), was the nephew of William Henry Seward, governor of New York State and President Lincoln’s Secretary of State. Clarence’s father died when the boy was seven and he was sent to live with William’s family in Auburn. Letters from Clarence’s mother to William and Clarence are full of gratitude, and reminders to appreciate the charity of family, respectively. 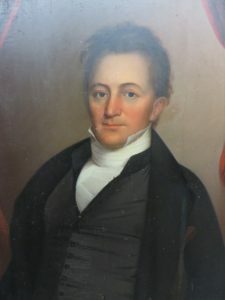 The Seward Family Digital Archive, a project of the University of Rochester and others, is now available at https://sewardproject.org/. Still in progress, it contains letters to and from the family, with biographical information about each person who wrote or received letters. “Uncle” didn’t agree to the transfer and Clarence graduated from Geneva College in 1848. After he passed away in Geneva in 1897, a eulogy was presented before the college’s Phi Beta Kappa Society and later published. Clarence married Caroline deZeng (1828-1906) in 1851. Although I found no information as to how and when they met, they married three years after his graduation so a Geneva courtship seems probable. 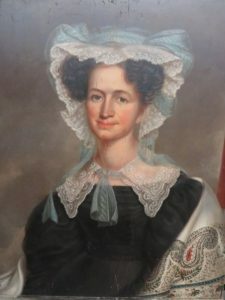 Caroline deZeng Seward was the daughter of William Steuben deZeng (1793 – 1882) and Caroline Rees (1793-1878). William came to Geneva in 1812. He owned the Ontario Glass Works Company (on Glass Factory Bay), and helped found Geneva College and Trinity Episcopal Church. They lived in the house on Hamilton Street where their granddaughters Alice and Caroline summered during World War I. This summer we received portraits of William and Caroline deZeng, and one son Edward. For many years they hung in Anne deZeng Waring’s home at 715 South Main Street. Mrs. Waring’s great-niece and great-nephew, Olivia Warley Gutoff and Randy Warley, donated the paintings to us and we are happy to have them back in Geneva. 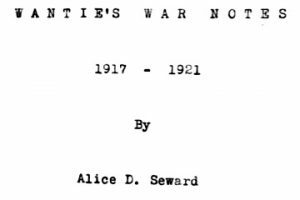 Please return in November when I’ll share Alice Seward’s thoughts on World War I, written from her homes in New York City and Geneva.